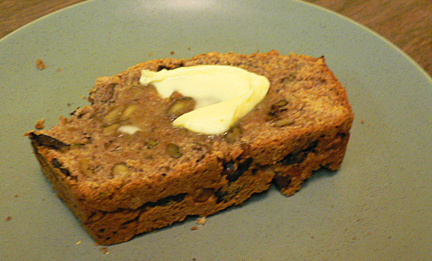 So easy to prepare, this yeast-free quick bread is country living no matter where you are! Pictured here using sun-dried black olives, fresh rosemary and mixed whole grain flours. In a large bowl, thoroughly combine the flour, baking powder, sea salt and herbs. In a small bowl, combine rice milk, olive oil and rice syrup. Add to flour mixture and stir until just combined. 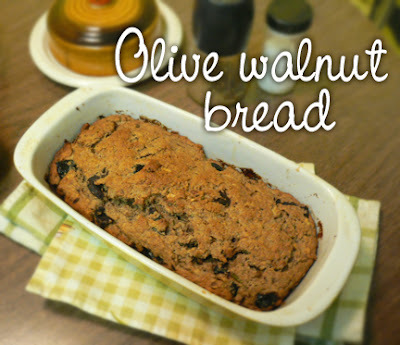 Fold in olives and walnuts. Heat oven to 350F and lightly grease a loaf pan (not too big). Scrape the batter into the pan and smooth the top a bit. Brush on a little rice milk all over the surface. Bake for 45 to 50 minutes or until a knife inserted comes out clean and dry. Makes 1 loaf. Serve warm with soup and salad for a meal, or spread with hummus or tofu spread for a hearty snack.